WordPress Beta 1 for version 3.6 is available for download and testing – that was declared at WordPress official blog at April 4, 2013. Product is still under development and it’s not recommended to setup it on a production site. Inspite of this, independently who are you, WordPress plugin or theme developer, or a WordPress hosting provider, you are encouraged to put new coming WordPress version into testing environment, test it thoroughly against your products and environment and try to find bugs or themes, plugins incompatibility issues and problems. Do you wait something new, something interesting from the latest WordPress version? Download Beta version here. 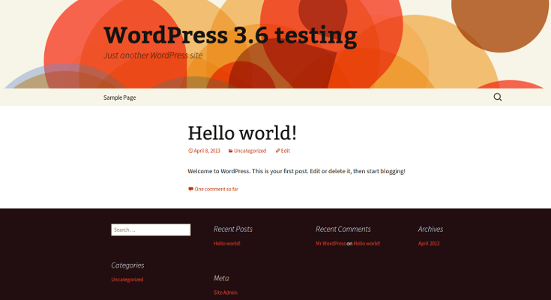 What’s new in WordPress Beta 1 of version 3.6? Thus, I went to conclusion that WordPress developers team made a good job producing updated product with so high level off backward compatibility. What do you think? This entry was posted on Monday, April 8th, 2013 at 11:09	and is filed under WordPress. You can follow any responses to this entry through the RSS 2.0 feed. You can skip to the end and leave a response. Pinging is currently not allowed.